With the Heritage Tourbillon, H. Moser & Cie. pays tribute to exceptional artisan watchmaking. This exceptional timepiece links tradition and modernity, two elements which coexist in all creations by H. Moser & Cie. The Heritage Tourbillon is a salute to watchmaking past and present. It is the distillation of H. Moser & Cie.'s 187 years of watchmaking expertise. With the Heritage Perpetual Moon, H. Moser & Cie. is re-establishing the prestige of the most poetic complication ever: the representation of the lunar cycle. With its influence over the seas and the oceans, the lunar body holds a mysterious fascination for man. Showcased in a large window at 6 o'clock, the eye-catching moon elevates this model to an expression of classical watchmaking. The Heritage Perpetual Moon also marks the introduction of the Heritage family of watches, joining Endeavour, Venturer and Pioneer in the H. Moser & Cie. collection. Renowned for the beauty of the dials it creates, H. Moser & Cie. has reinterpreted the famed sunburst pattern featured on its fumé dials and is unveiling a new model that honours tradition and craftsmanship: the Endeavour Concept Guilloché Limited Edition, with a dial engraved by a skilled guilloché craftsman. Combining expertise and a modern touch, H. Moser & Cie. has created a contemporary model with an understated, minimalist design that remains true to the Concept Series philosophy: no logos, no indices. 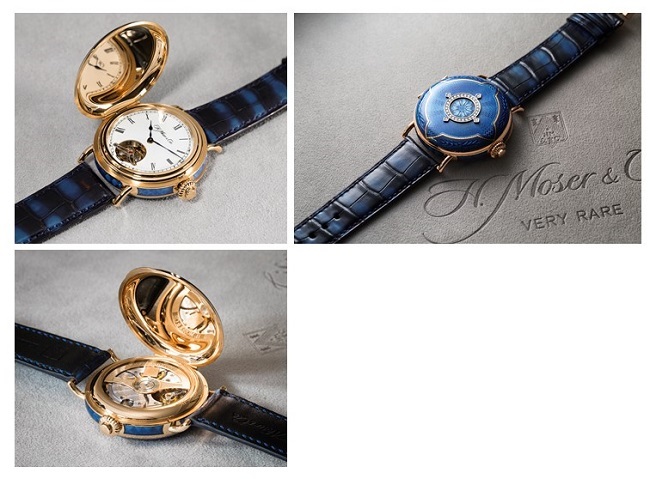 AN EXQUISITE WATCH: THE VENTURER SMOKY SAPPHIRE FROM H. MOSER & CIE. Alternating diamonds and sapphires form a sparkling circle, bringing the Venturer Smoky Sapphire to life. Carefully chosen sapphires in gradually deepening shades of blue form the dial of this exceptional watch. H. Moser & Cie. has chosen brilliant-cut stones for this exquisite reinterpretation of the nuances of its famed fumé dials. With their Concept Series of watches, that have neither indices nor logo, H. Moser & Cie. is making a clear statement. A true luxury product is unmistakeable and requires no marketing or branding to speak on its behalf. By focussing on absolute simplicity, H. Moser & Cie. is returning the product to centre stage, as an understated star. Pared down to the essentials, the Venturer Small Seconds Purity collection follows this logic, brilliantly illustrating the minimalist philosophy of "less is more". 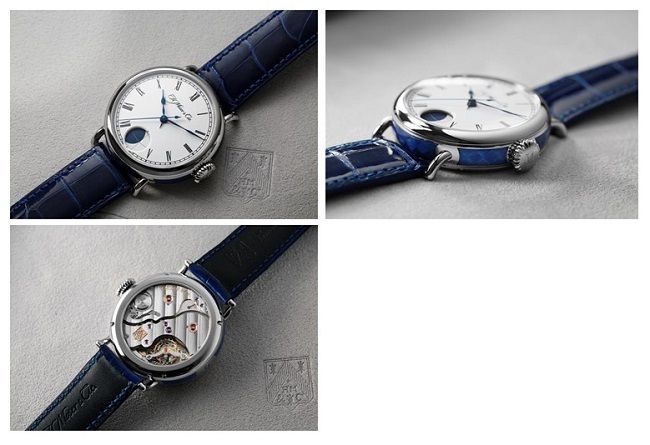 Once again, H. Moser & Cie. has proven that authenticity can provide a power and dynamism which is rarely achieved. H. Moser & Cie. likes to surprise... often in the most unexpected of places. The Swiss Alp Watch Minute Retrograde is a case in point. Pairing the rectangular case of its Swiss Alp Watch with the highly technical movement from its sister brand HAUTLENCE, H. Moser & Cie. has created a delightful surprise which combines tradition with modernity. This unique approach faithfully employs classic Haute Horlogerie techniques whilst incorporating the ultimate in technological movements. A striking contrast in a mesmerisingly beautiful watch that is compelling from every angle. H. Moser & Cie. was created by Heinrich Moser in 1828. Based in Neuhausen am Rheinfall, it currently employs 50 people, has eight of its own calibres and produces 1,200 watches per annum. H. Moser & Cie. manufactures parts such as regulating organs and balance-springs, which are used for its own production as well as to supply its partner companies. H. Moser & Cie. is honoured to have a Moser family member with the company as Honorary Chairman and President of the Heinrich and Henri Moser Foundation. The aim of the Moser Foundation, created by one of Heinrich Moser’s descendants, is to keep the family history alive and seek out antique pieces for the Moser Museum, located in Charlottenfels Manor, Heinrich Moser’s family home. With its substantial watchmaking expertise and highly acclaimed experience in the sector, MELB Holding holds shares in H. Moser & Cie. and Hautlence. MELB Holding is an independent family group, based in the heart of the legendary Vallée de Joux.